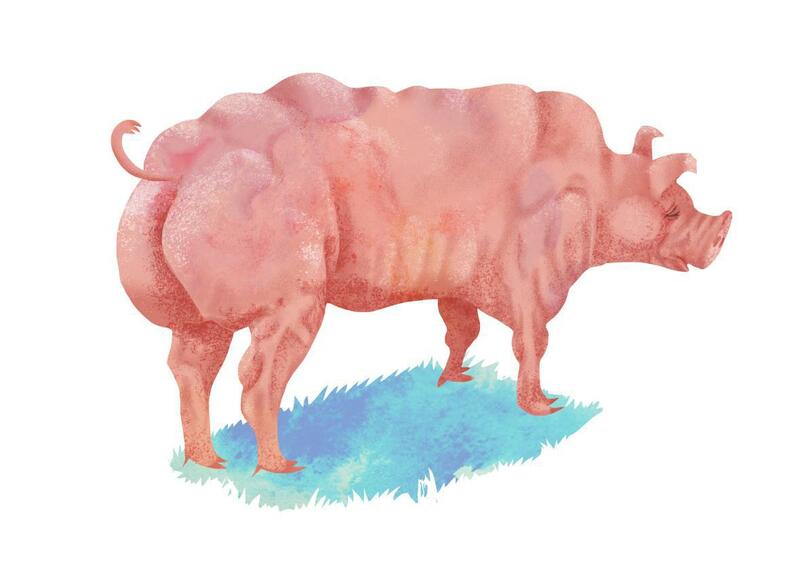 The ethical problems with super-muscly pigs. Technologies to genetically engineer sentient animals for meat production raise questions about the human-animal relationship. A version of this article first appeared in the Spring 2016 edition of Issues in Science & Technology. Animal research is moving rapidly in two divergent directions. Research on animal cognition, behavior, and welfare is teaching us that many animal species have complex cognitive and emotional lives and needs, which are linked to the way they experience and explore their surroundings. For instance, pigs are quite advanced: They have long-term memory and are sensitive to the emotions of other pigs. They can also use mirrors to locate food behind barriers and can determine whether humans are paying attention to them by looking at people’s heads. There lies a danger in underestimating such capabilities: If animals live in a very restricted environment without any cognitive or social challenges, preventing them from expressing species-typical behavior, they can experience welfare problems. Research insight into animal cognition is giving us—or should be giving us—increased empathy for other species and better recognition of their needs. At the same time, new gene-editing technologies are allowing scientists to design animals in ways that maximize their economic value as food sources. These technologies permit the direct manipulation of virtually any gene of a living organism more easily, cheaply, and accurately than has ever been possible. In the last five years, these technologies have been used to edit the germline of more than 300 pigs, cattle, sheep, and goats. In June 2015, a team of scientists from South Korea announced the creation of super-muscly pigs using the single-gene editing technology TALENs, short for transcription activator-like effector nucleases. Whereas the debates on the ethical and social aspects of genome editing of human embryos and crops have triggered public, political, and media firestorms, genome editing in animals has received far less ethical scrutiny. Yet gene modification of farm animals like super-muscly pigs raises complex ethical questions about animal welfare, about who is benefiting from these technologies, and about the evolving, contradictory relationship between humans and animals. These questions have been ignored so far, but our growing awareness of the rich inner lives of many animal species makes such neglect increasingly troublesome. Concerns about the welfare of genetically engineered animals starts with the very process of creating them: Sperm and egg donors and surrogate mothers are normally killed if they are not reusable for other purposes (such as in other animal experiments). Animals whose modifications end up being undesirable either die because their health is severely compromised or are killed because they are neither commercially valuable nor usable for scientific purposes. Genome editing techniques cause a range of animal welfare problems, such as very low live-birth rates in some species; abnormal sizes, which render them incapable of natural movement; and respiratory and cardiac problems. For the super-muscly pigs created by the South Korean scientists, the large size of the newborn piglet leads to birthing difficulties; only 13 of the 32 piglets survived as long as eight months, and only one survived considerably longer in a healthy state. This is alarming, given that the piglets’ births and lives takes place in research labs under strict medical observation and highly controlled circumstances—where normal survival rates should be quite high. Although genome editing techniques are expected to offer a more precise modification of the genome, they generate many more animals than are actually used for experimentation. For example, a 2016 paper in Transgenic Research by Wenfang Tan (of the University of Edinburgh) and others surveyed the published literature and determined that out of 23,216 pig embryos, which were implanted in 112 pigs and generated 62 pregnancies, 237 pigs were born alive. Of these, 179 (76 percent) were properly modified or “edited,” whereas the remaining 58 were not usable for the experiments. Scientists working in the field concentrate on the 76 percent of the pigs born alive and properly edited, which represents a success with respect to previous technologies. However, if we consider the number of embryos needed, the pigs involved in pregnancies, and the individuals born without the modification needed, it’s clear that evaluation of these procedures’ “efficiency” depends on whether and how one counts the lives of the animals involved at all stages of the process. Threats to the animals’ welfare do not end with their creation in the lab. Pigs, like many other animals used in agriculture, have complex abilities and needs in both the cognitive and social domains. As sentient beings, they have what biologists and veterinarians call “ethological needs,” including the desire to explore their surroundings and to engage in meaningful social interaction with others of their species. Animal welfare researchers have shown that if sows are not permitted to build nests prior to piglet birth, or are prevented from fulfilling other behavioral needs, they might engage in behavior such as bar-biting (chewing the metal bars of their crates), tail-biting, head-weaving, or vacuum chewing (chewing when nothing is present). Farm animal suffer from diseases, lesions, or injuries (sometimes linked to high stock densities or quality of flooring), due to lack of space and behavioral stimuli, malnutrition, stress during handling, isolation, transportation, and, ultimately, killing methods. The numbers of pigs involved with the super-muscly experiments may seem fairly small but some scientists promote genetically modified animals in terms of food production. They seem to regard it as a solution to ensure food security for a rapidly growing human population under constrains of decreasing resources and a changing world climate. But they don’t seem to take into account the ethical costs; the economic interests involved create a powerful disincentive to consider welfare concerns as well as other concerns connected to GM animals. Animal production creates substantial water and land pollution and requires vast amounts of territory—an estimated 45 percent of the global land surface area. Meat consumption is also linked to increased health risks such as cancer, ischemic heart disease, stroke, and diabetes mellitus. A report from the United Nations Environment Program concludes that both human and global environmental health would benefit from a substantial diet change away from animal products on a global scale. Yet demand for meat and dairy products continues to increase worldwide, driven especially by expected rising standards of living in China, India, and Russia. To the extent that genetic modification of livestock increases meat production, it is also likely to lead to a rebound effect, driving prices down and further increasing the demand for animal products—just as making roads wider or paving more parking lots tends to make traffic problems worse. Thus economic incentives, changing demographics and dietary habits, and advances in gene-editing technology are all pushing in the same direction: toward increased stress on global environmental and food production systems. Given these concerns, there is profound unresolved tension between the plea by an increasing number of scientists and institutions to decrease in the use of animals for food, and, on the other hand, biotechnologists’ support for ever-enhanced forms of animals for meat and dairy production. This tension is fundamentally political in nature, yet it is also a problem of ethics and values, not only because these technologies have negative impacts on animal welfare but also because they profoundly shape the way in which we think about animals. Although science aimed at understanding the cognitive capacities of animals gives us reason to appreciate and empathize with dogs and pigs alike, technological advances like gene editing enhance the drift of farm animals’ moral status away from living beings that have inherent value (a moral standing in themselves) to products that only have instrumental value and a market price. Gene-edited animals like super-muscly pigs are brought to life and optimized to meet human desires. In the process, these designed animals may suffer more than their non-GM relatives because of their extreme physiological traits. They are a technological success exactly because they are optimized—for example, via an increase in body mass to match their instrumental purpose—but what about their suffering?